Donald Trump Says Blacks and Hispanics Cause Crime; Racist or Honest? Oh for real? Donald Trump is not holding back. 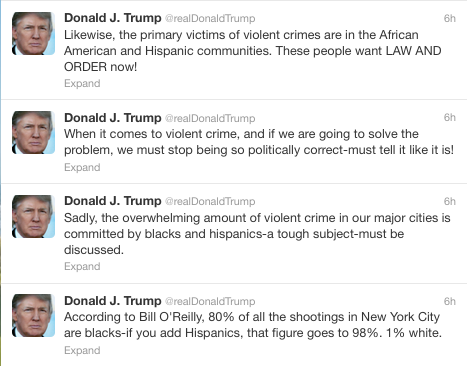 Today, the Donald took to Twitter to express his views on crime in major cities and how it is directly related to African Americans and Latino-Americans. His goal seems to be that he wanted to to put political correctness aside and tell the truth…. whatever truth that is. 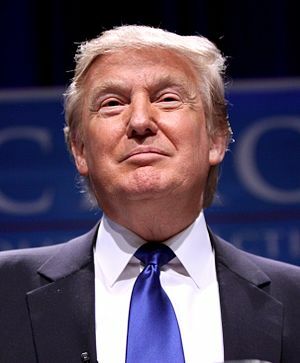 Read More Donald Trump Says Blacks and Hispanics Cause Crime; Racist or Honest? | CocoaFab. This entry was posted in News from the Soul Brother and tagged African Americans, Donald Trump, Hispanic and Latino Americans, Political correctness, race, television, twitter. Bookmark the permalink. 1 Response to Donald Trump Says Blacks and Hispanics Cause Crime; Racist or Honest? I say racist, because the only reason why there are “more” Latino and African American crime cases is because of racial profiling. Check the U.S. Census and compare arrests vs convictions and you will see a racial disparity. How about the “Stop and Frisk,” law in NY, or the Mass Incarceration of African Americans and Latinos and the “war on drugs.” Have you seen the documentary “The House I live In” it is a must see for all people. To all the folks out there who don’t know, cops actually drive through certain neighborhoods to make their quotas, and do you think they choose White neighborhoods, ah no.